CRUZ BAY – The Virgin Islands Police Department’s Weed and Seed Program in the St. Thomas District along with other Law Enforcement agencies are scheduled to conduct its annual Drug Education For Youth and Underage Drinking Prevention Camp from August 16 to 21 in St. John. The VIPD Weed and Seed Program in the St. Thomas District in conjunction with the US Attorney’s Office, the Virgin Islands National Guard Counterdrug Task Force, Drug Enforcement Administration, Law Enforcement Planning Commission, Project Safe Neighborhoods V.I. and the Department of Human Services are slated to conduct their yearly Drug Education for Youth and Underage Drinking Prevention Camp in St. John. On August 16, ninety youth participants ranging from nine to sixteen years old will be attending this week long camp. The youngsters will learn about anti-drug education, underage drinking, building gang resistance, leadership, team-building, conflict resolution, goal-setting, self-esteem development and peer leadership. In addition to the classroom exercises, the participants will also take part in outdoor-exercises to include a bonfire, hiking, kayaking/snorkeling, community cleanup efforts and daily physical fitness. The Weed and Seed DEFY Program is a youth outreach program intended to utilize role models — military personnel, law enforcement officers and community leaders – to promote positive life choices, including drugs, alcohol, gangs and gun resistance. 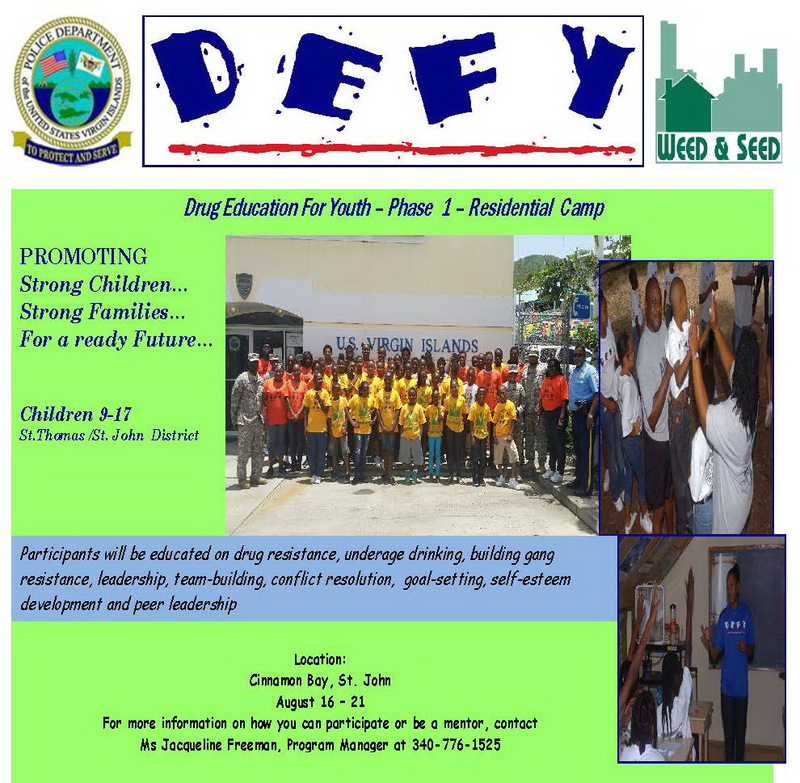 DEFY is a National Program being utilized throughout the United States that is geared towards improving the quality of life in designated neighborhoods. The Weed and Seed Program invites children living within the St. Thomas/St. John District to participate in this educational program. For more information on how you can be a part of this Program and/or become a mentor for one of the participants, you can contact Jacqueline Freeman, Weed and Seed Program Manager for the St. Thomas/St. John District at (340) 344-4516 or (340) 776-1525. The project is funded by a Grant from the Law Enforcement Planning Commission awarded by the Bureau of Justice Assistance from the U.S. Department of Justice.